Has the time come to delve into the delicious world of first foods with your little one? I have to admit that this was one of my favourite things about the first year with a new baby – the facial expressions, the messy moments, the different reactions to each flavour – prepare for a belly full of cuteness! There are so many conflicting theories when it comes to starting solids and many parents feel overwhelmed before they even start. It doesn’t need to be difficult at all! Introducing solids to babies is a special time that shouldn’t be stressful for anyone. It should be filled with fun first tastes, nutritious recipes and plenty of photo-worthy moments along the way. And it will definitely be filled with mess! When to start solids will depend on your baby. It is recommended to start around six months when your baby shows signs of readiness. If your infant is able to sit up unassisted and appears to have an interest in watching you eat, then this is a good time to make the leap to starting solids. Pear – the friendly food! Pear is an ideal first food when feeding baby solids. Most babies enjoy the taste – try it, pureed pear is actually really good. They’re a food that very few people react badly to so your baby is likely to cope well with them, even if they are prone to allergic reactions or food intolerances. As a bonus, pears contain fibre and are an easy way to help ease constipation. 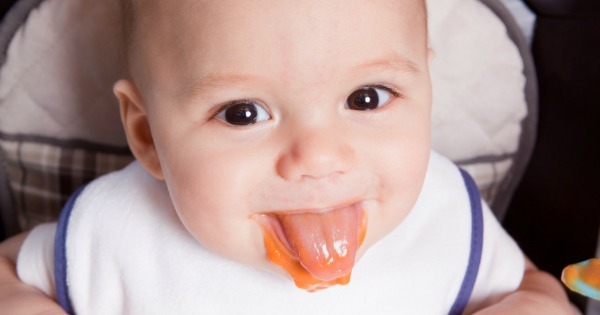 You really only need a spoonful to begin with when starting babies on solids. Just half to one teaspoon of food can be enough for one day. Some babies will want more right away; others will look at you in horror as the food dribbles out of their mouth. Both reactions are perfectly normal. When starting baby on solids, gradually increase the amount offered. Making the switch from purees to finger food can be a nervous time for parents, but it should be a gradual process. From around the eight month mark a baby will be ready to try some soft finger foods. Opt for smooth or soft lumpy textures in between. You can vary the texture of the food as your baby becomes more used to the process. And don’t worry about how many teeth your bub has! Those little gums are pretty good at mashing things, even if there aren’t many teeth there yet! There is no set time of the day to feed your baby solids. Opt for a time that is the least stressful for you. Breakfast may be hectic if you are trying to get out the door and you may find that during dinner your baby is tired and cranky. Lunch can be a good time to start, but again, choose a time that best works with your routine. After a few weeks, increase meal time to twice a day, then, by 12 months, aim for three meals a day. It’s best to wait two to three days before introducing each new solid food to your baby. This gives you time to watch out for any symptoms of food allergies. Once your baby has tried a few new fruits and veggies, you can start to combine them into various flavours and add meat into their diet as well. Keep a food journal or a record on the fridge with what your baby tries, and likes or dislikes. This makes it easier to meal plan and is also helpful if someone else is watching or feeding bub. If your baby rejects a food or doesn’t seem to like it, don’t give up too soon! Try again a few days later and see if the response is any different. Many parents choose to make their own baby food and this can be a great idea, especially if you have leftover fruit and veg you would like to use up. It’s fairly easy to make food for your baby and then portion it out and freeze it for later on. There are all kinds of pouches and containers available to help you with this – but you can also use a trusty, basic ice cube container. 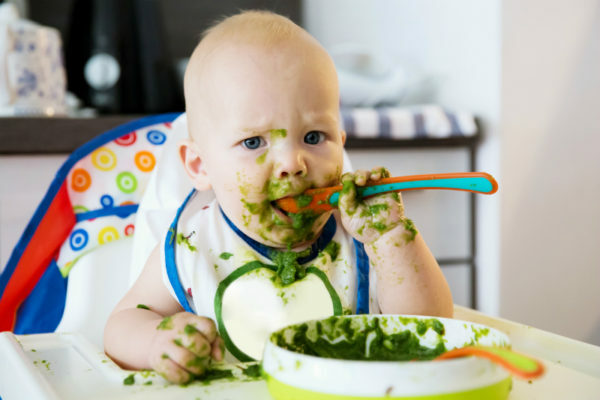 Once babies start to enjoy first foods, you may find they are always hungry at the most inconvenient times! Having some ready-made jars or pouches of baby food in the pantry can be a great fallback for the days you just don’t have time, or need something convenient to throw in the nappy bag. 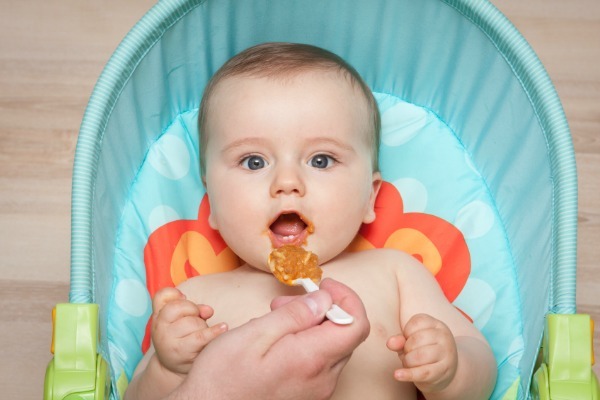 When feeding babies solids, you may find some infants will gag or cough. These are normal reflexes that will gradually get better as your little one learns how to properly chew and swallow. When it comes to solids for babies, you can expect bite-sized meals, but platters full of fun for everyone involved. Meal time will never be the same!